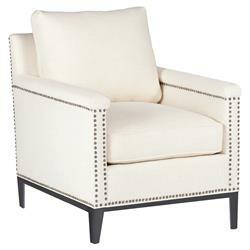 Looking for the perfect classic contemporary arm chair? This just about nails it. Featuring clean, sleek lines and a loose back and seat cushions for serious comfort, a nail head trim and metal base takes this piece to new heights of style. Custom made proudly in America, please allow 8-10 weeks for production.